This is the first time that Barnet & Enfield applied for & received the Westhill award. Both are religiously very diverse boroughs & have significant numbers of all the major faith communities represented in the UK. Barnet has the largest number of Jewish people in Britain & there are also representatives of other smaller faith groups such as the Alevi Community in Enfield as well as significant numbers of Jains, Baha’i & Zoroastrians. Both SACREs have strong relationships with their representative religious communities & their local authority. The aim of the project is to use these local resources to make closer links between schools & faith communities. It is planned that the project would begin in the autumn term 2015 & train secondary school students in one school in Barnet & one school in Enfield to prepare presentations for 3 local linked primary schools. The young people would be expected to discuss with their faith communities the materials that they are producing & these would be tailored to the relevant primary school agreed syllabus for each of the boroughs. We have chosen this approach as primary schools have expressed a need for high quality speakers & faith communities have voiced concerns about how they can best support religious education in their locality & the need for training & appropriate material to enhance the locally agreed syllabi. Discussions have already taken place with the two secondary schools & their linked primary schools & all are enthusiastic about having closer links made between their local communities & between secondary & primary schools. Faith groups have also expressed their enthusiasm & support for the project. We also believe that the project will provide compelling learning experiences for all involved. The young people will be learning from their religious communities, they will be able to speak with confidence about their religions & will be sharing their ideas with their peers. We will encourage a variety of teaching & learning styles & materials. From the experience of other projects we have appreciated that primary school pupils love listening to other young people & that there is often a better understanding of the use of appropriate language & concepts. An enquiry model will be used throughout the learning process. Reflect on what has been experienced, observed & understood & modify the pilot programme before it is rolled out to more schools. The Enfield Faith Ambassadors Project ran parallel to Barnet’s project, beginning with a meeting in the Autumn Term with a group of enthusiastic students from Winchmore School; the secondary school chosen to visit two local Primary schools; Firs Farm primary School and Highfield Primary School. The students ‘applied’ for the position of Faith Ambassador and were selected and supported by their teacher for Religious Education, Naomi Franks. Students were introduced to the Enfield Agreed Syllabus and the Scheme of Work that accompanies it, so they could see the children’s prior knowledge for their faith in each year group and term, allowing them to support and enhance the teaching of Religious Education, consolidating and extending the children’s learning. They received training on content and pedagogy, with a focus on ‘Enquiry based learning’. Students were encouraged to consider the level that the children will be working at in primary school and were shown examples and ideas; notes were taken in the students ‘Reflective Journals’. The second session gave the students an opportunity to showcase their presentations to their peers and receive constructive feedback. This opportunity was also used to ensure presentations were interactive and correctly pitched, developing students’ presentation and public speaking skills. 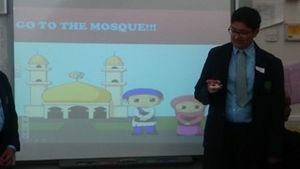 In the spring and summer terms, Faith Ambassadors from the Christian, Hindu and Muslim faith, visited both Primary Schools to deliver their fabulous presentations! Presentations were very well received by the schools; all were interactive and many included artefacts for the children to feel and explore as well as the opportunity for children to ask questions.